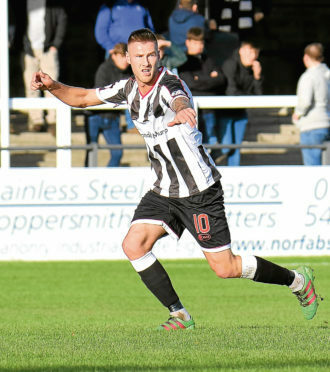 Elgin City have now reached the do-or-die stage in their bid to reach the League 2 play-offs, according to midfielder Brian Cameron. Anything but a win at Stenhousemuir today and City will find their task nearly insurmountable, with this afternoon’s hosts already four points ahead with a game in hand. An opportunity to close the gap passed them by during the week with a 2-0 home defeat by Stirling Albion coming as Stenny went down 2-1 to bottom club Cowdenbeath. Midfielder Brian Cameron feels they have been fortunate to find themselves still in with a shout but cannot afford any more slip-ups. He said: “We knew we had to win on Tuesday but this weekend becomes huge for us. We have to give it 100 per cent. We all agree, having kept track of all the results, we have to take one of these chances sooner or later. This is probably do or die – we have to get the win. “In a way I’m not surprised we’re still in there as it’s a really competitive league that will go to the wire. We can count ourselves lucky that we’re still in with a chance but it’s still in our hands.” If Elgin are to make a late surge for the play-offs, ending their away hoodoo has to be a priority. They have not won on the road since November 11 against Cowdenbeath, the side that beat them at Central Park last Saturday. The disparity in their home and away form has stumped manager Gavin Price; Tuesday’s loss was their first in nine games at Borough Briggs, while it is nine without victory on their travels. Cameron said: “I really don’t know how it’s come about. It’s a bad record and sooner or later it has to change. We don’t approach away games any different to our home games, and our home form is incredible. “We can’t put our finger on it. People say travel sickness but most of the boys are from down the road. It doesn’t bother me where we play and the boys and Gavin Price have tried everything.